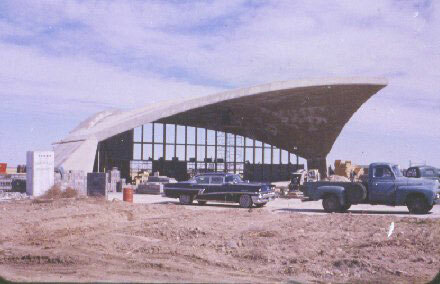 Constructed in 1959 within the former Stapleton International Airport complex, this unique 9,400 square foot cement structure is an example of how sophisticated engineering can make an innovative architectural design a reality. 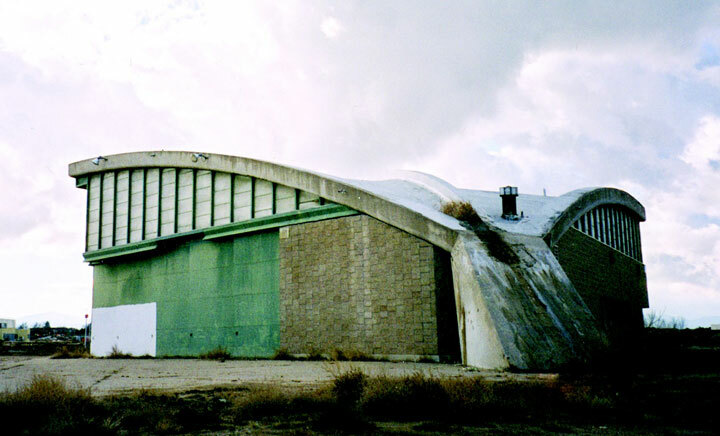 This barrel-vaulted thin-shelled concrete hangar was designed by Fisher, Fisher, and Davis, and engineered by Milo Ketchum, a Denver engineer of national renown. Thirty-three feet at its apex, the thin shell concrete arch is diamond-shaped and spans 160 feet without center supports. Hangar 61 is unlike other remaining hangars from the old airport and as a result was nominated to be listed as a Denver Landmark. The Ideal Cement Company, one of the largest in the industry and one of the most successful companies in Colorado history, was privately owned by the prominent Boettcher family of Denver and Hangar 61 was built to house its Fairchild F-27 turbo-prop airliner. The hangar not only represents the initial expansion of Stapleton International Airport, but signifies Denver’s role as the U.S. entered the “Jet Age.” Hangar 61 was listed on the State Register of Historic Properties in 2006. In 1995 the City and County of Denver closed Stapleton International Airport and opened Denver International Airport twenty miles to the east. As development was taking shape at Stapleton, no use had been found for Hangar 61 and the possibility of demolition seemed eminent. The City and County of Denver considered selling the property to Forest City Stapleton, Inc., developer of the old Stapleton International Airport complex. Because the building had been vacant since the mid-1990s and no developer has produced a viable rehabilitation plan, Forest City Stapleton, Inc. felt demolition may be the only solution for this “eyesore” in the midst of a dynamic redevelopment project. The preservation of Hanger 61 is an excellent example in how a nonprofit organization and private developers can work together towards saving a building that was widely considered too strange and too far gone to ever serve a contemporary use. Colorado Preservation, Inc. purchased the property with the assistance of State Historical Funds in 2007. Ownership later was transferred to 620 Corp, LLC. who had first heard about the building from the Most Endangered Places listing. 620 Corp, LLC completed the restoration of the entirely customized building to include initial structural work, internal upgrades, replacing windows and creating a landscaped parking lot. In 2010, the 200-member Stapleton Fellowship Church purchased the property and added a 300-seat auditorium, state-of-the-art stage, children’s ministry space, and gathering areas to be made available for public use. Today, the building remains a modernist landmark that speaks to the power of creative vision and individuals championing to its adaptive reuse.